We’re trying to clear our kitchen cupboards at the moment, and mine are filled with all sorts. In particular, in looking through the cupboards, I came across 3 or 4 boxes of risotto rice and decided to use some of it up tonight. Some people think of risotto as being unhealthy – probably because of the carbohydrate and creamy cheesiness. It doesn’t have to be unhealthy though, and this one certainly wasn’t. It was packed full of vegetables and made for a delicious end to the weekend. 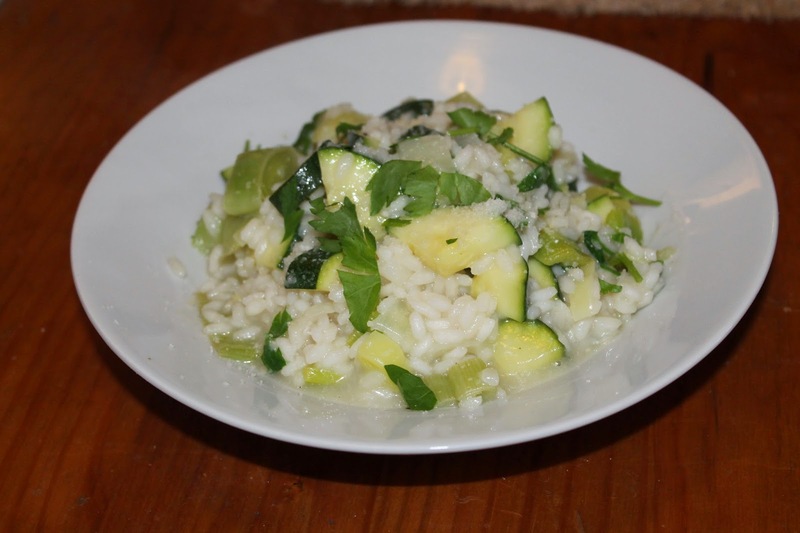 You could use any vegetable you want to this risotto – just add at varying times of the cooking process depending on how long (or little) time they need. This will serve 4-5 and takes about 40 minutes to make. 1. Chop the onion and add to a casserole dish with half of the olive oil. Sweat over a medium heat for two minutes, the add the sliced leeks and cook for a further 2 minutes. 2. Add the risotto rice, stir for 1 minute then add the white wine. Let the wine simmer down. 3. Pour the stock in gradually, stirring often. This process will take around 25 minutes. Top up with water if necessary. The rice should be al dente but getting gloopy. 4. Chop the courgettes and add the the pan; stir well. Pour the remaining olive oil, grated parmesan and chopped parsley on top then put the lid on the pan, turn the heat off and leave for 5-10 minutes. 5. Take off the lid and stir well – the courgettes should have cooked in the residual heat from the pan. Serve topped with a little more grated parmesan.